Definition at line 29 of file CSlider.h. Definition at line 40 of file CSlider.h. Definition at line 35 of file CSlider.h. Definition at line 30 of file CSlider.cpp. Definition at line 48 of file CSlider.cpp. Definition at line 66 of file CSlider.cpp. Compile, i.e., find the objects pointed to by the CN. Definition at line 69 of file CSlider.cpp. References CCopasiObject::getObjectDataModel(), mCN, mpSliderObject, mSync, setSliderObject(), and sync(). Referenced by SliderDialog::addSlider(), CopasiSlider::CopasiSlider(), SliderDialog::createNewSlider(), SliderDialog::getCSlidersForObject(), and SliderDialog::sliderObjectChanged(). Converts the scaling name to the corresponding enum. Definition at line 380 of file CSlider.cpp. References linear, logarithmic, and undefinedScale. Definition at line 396 of file CSlider.cpp. Retrieve the key of the associated entity. Definition at line 101 of file CSlider.cpp. Referenced by SliderDialog::equivalentSliderExists(), SliderDialog::getCSlidersForObject(), and CCopasiXML::saveGUI(). Definition at line 91 of file CSlider.cpp. Retrieve the slider maximum value. Definition at line 348 of file CSlider.cpp. Referenced by CopasiSlider::calculatePositionFromValue(), CopasiSlider::calculateValueFromPosition(), CopasiSlider::maxValue(), CopasiSlider::minorTickInterval(), CCopasiXML::saveGUI(), SliderSettingsDialog::updateInputFieldsValues(), CopasiSlider::updateLabel(), and CopasiSlider::updateValue(). Retrieve the slider minimum value. Definition at line 320 of file CSlider.cpp. Referenced by CopasiSlider::calculatePositionFromValue(), CopasiSlider::calculateValueFromPosition(), CopasiSlider::minorTickInterval(), CopasiSlider::minValue(), CCopasiXML::saveGUI(), SliderSettingsDialog::updateInputFieldsValues(), CopasiSlider::updateLabel(), and CopasiSlider::updateValue(). Retrieve the original slider Value. Definition at line 285 of file CSlider.cpp. Referenced by CopasiSlider::originalValue(), and SliderSettingsDialog::updateInputFieldsValues(). Retrieve the scaling of the slider. Definition at line 369 of file CSlider.cpp. Referenced by CopasiSlider::calculatePositionFromValue(), CopasiSlider::calculateValueFromPosition(), CCopasiXML::saveGUI(), and SliderSettingsDialog::updateInputFieldsValues(). Definition at line 176 of file CSlider.cpp. Referenced by SliderSettingsDialog::browseButtonPressed(), SliderDialog::equivalentSliderExists(), CopasiSlider::object(), SliderSettingsDialog::setSlider(), CopasiSlider::updateLabel(), and CopasiSlider::updateSliderData(). Retrieve the slider object CN. Definition at line 179 of file CSlider.cpp. Definition at line 188 of file CSlider.cpp. Referenced by CCopasiXML::saveGUI(), and CopasiSlider::type(). Definition at line 290 of file CSlider.cpp. Referenced by resetRange(), CCopasiXML::saveGUI(), CopasiSlider::setMaxValue(), setMaxValue(), CopasiSlider::setMinValue(), setMinValue(), CopasiSlider::setNumMinorTicks(), setSliderObject(), CopasiSlider::setValue(), CopasiSlider::sliderValueChanged(), SliderSettingsDialog::updateInputFieldsValues(), CopasiSlider::updateLabel(), CopasiSlider::updateSliderData(), CopasiSlider::updateValue(), and CopasiSlider::value(). Returns wether the value is to be kept in sync the the objects value. Definition at line 86 of file CSlider.cpp. Definition at line 366 of file CSlider.cpp. Referenced by CopasiSlider::minorMajorFactor(), CCopasiXML::saveGUI(), SliderSettingsDialog::updateInputFieldsValues(), and CopasiSlider::updateSliderData(). Definition at line 357 of file CSlider.cpp. Referenced by CopasiSlider::calculatePositionFromValue(), CopasiSlider::calculateValueFromPosition(), CopasiSlider::minorTickInterval(), CopasiSlider::numMinorTicks(), CCopasiXML::saveGUI(), SliderSettingsDialog::updateInputFieldsValues(), and CopasiSlider::updateSliderData(). Checks whether the object the slider points to actually exists. Returns true if it does. Definition at line 408 of file CSlider.cpp. References CCopasiDataModel::getModel(), CCopasiObject::getObjectDataModel(), mCN, mpSliderObject, and CCopasiDataModel::ObjectFromName(). Reset the minimum and maximum value to defaults. For the minimum this is half the current value. For the maximum this is twice the current value. Definition at line 159 of file CSlider.cpp. References C_FLOAT64, getSliderValue(), mMaxValue, mMinValue, mSliderType, and Undefined. Referenced by SliderSettingsDialog::browseButtonPressed(), SliderDialog::createNewSlider(), and CopasiSlider::updateValue(). Sets the value of the slider back to it's original value. Definition at line 154 of file CSlider.cpp. Definition at line 94 of file CSlider.cpp. Referenced by SliderSettingsDialog::browseButtonPressed(), SliderDialog::createNewSlider(), and CCopasiXMLParser::SliderElement::start(). Set the slider maximum value. Definition at line 323 of file CSlider.cpp. References getSliderValue(), mMaxValue, mMinValue, mpSliderObject, mSliderType, mValue, Undefined, and writeToObject(). Referenced by CopasiSlider::setMaxValue(), CCopasiXMLParser::SliderElement::start(), and SliderSettingsDialog::updateSlider(). Set the slider minimum value. Definition at line 295 of file CSlider.cpp. Referenced by CopasiSlider::setMinValue(), CCopasiXMLParser::SliderElement::start(), and SliderSettingsDialog::updateSlider(). Set the sliders original value. Definition at line 191 of file CSlider.cpp. References mMaxValue, mMinValue, mOriginalValue, mSliderType, and Undefined. Referenced by CopasiSlider::setOriginalValue(), and SliderSettingsDialog::updateSlider(). Set the scaling for the CSlider. Definition at line 374 of file CSlider.cpp. Referenced by CCopasiXMLParser::SliderElement::start(), and SliderSettingsDialog::updateSlider(). Definition at line 104 of file CSlider.cpp. 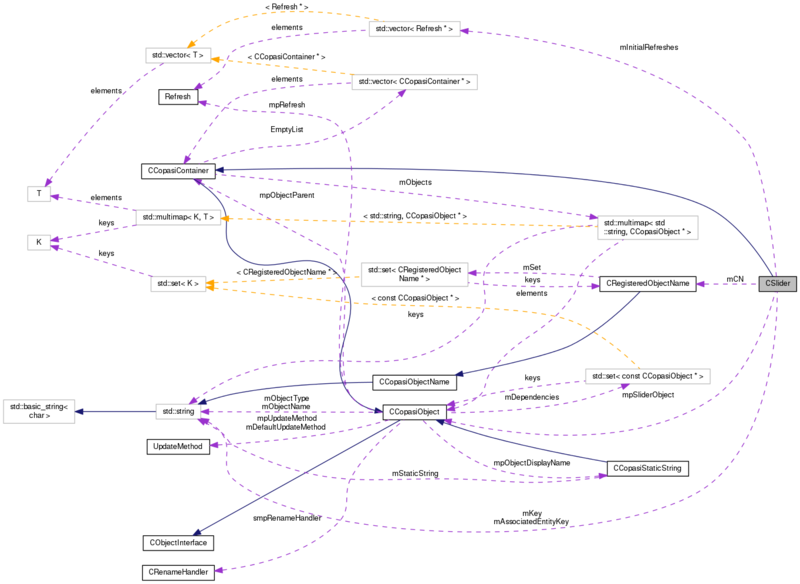 References CModel::buildInitialRefreshSequence(), C_FLOAT64, Float, CCopasiObject::getCN(), CCopasiDataModel::getModel(), CCopasiObject::getObjectDataModel(), getSliderValue(), Integer, CCopasiObject::isValueDbl(), CCopasiObject::isValueInt(), mCN, mInitialRefreshes, mMaxValue, mMinValue, mOriginalValue, mpSliderObject, mSync, setSliderType(), sync(), and Undefined. Referenced by SliderSettingsDialog::browseButtonPressed(), compile(), SliderDialog::createNewSlider(), CopasiSlider::setObject(), and CCopasiXMLParser::SliderElement::start(). Definition at line 169 of file CSlider.cpp. Definition at line 182 of file CSlider.cpp. Referenced by setSliderObject(), CopasiSlider::setType(), and CCopasiXMLParser::SliderElement::start(). Definition at line 215 of file CSlider.cpp. References mMaxValue, mMinValue, mSliderType, mSync, mValue, Undefined, and writeToObject(). Referenced by resetValue(), CopasiSlider::setValue(), CopasiSlider::sliderValueChanged(), CCopasiXMLParser::SliderElement::start(), and SliderSettingsDialog::updateSlider(). Sets wether the value is to be kept in sync the the objects value. Definition at line 81 of file CSlider.cpp. Definition at line 360 of file CSlider.cpp. Referenced by CopasiSlider::setMinorMajorFactor(), CCopasiXMLParser::SliderElement::start(), and SliderSettingsDialog::updateSlider(). Definition at line 351 of file CSlider.cpp. Referenced by CopasiSlider::setNumMinorTicks(), CCopasiXMLParser::SliderElement::start(), and SliderSettingsDialog::updateSlider(). Set the CSliders value to the value of the underlying object. Definition at line 245 of file CSlider.cpp. References C_FLOAT64, C_INT32, Float, CCopasiObject::getValuePointer(), Integer, mpSliderObject, mSliderType, mValue, UnsignedFloat, and UnsignedInteger. Referenced by compile(), and setSliderObject(). Set the objects value to the value stored in CSlider. Definition at line 265 of file CSlider.cpp. References C_INT32, CCopasiObject::isValueBool(), CCopasiObject::isValueDbl(), CCopasiObject::isValueInt(), mInitialRefreshes, mpSliderObject, mValue, and CCopasiObject::setObjectValue(). Referenced by setMaxValue(), setMinValue(), and setSliderValue(). The key of the associated entity of the slider's object. Definition at line 296 of file CSlider.h. Referenced by getAssociatedEntityKey(), and setAssociatedEntityKey(). The CN of the object that the slider modifies. Definition at line 351 of file CSlider.h. Referenced by compile(), getSliderObjectCN(), isValid(), and setSliderObject(). The sequnece of methods to update initial values depending on this sliders object. Definition at line 357 of file CSlider.h. Referenced by setSliderObject(), and writeToObject(). The key of the slider. Definition at line 291 of file CSlider.h. Referenced by getKey(), and ~CSlider(). Definition at line 326 of file CSlider.h. Referenced by getMaxValue(), resetRange(), setMaxValue(), setMinValue(), setOriginalValue(), setSliderObject(), and setSliderValue(). Definition at line 321 of file CSlider.h. Referenced by getMinValue(), resetRange(), setMaxValue(), setMinValue(), setOriginalValue(), setSliderObject(), and setSliderValue(). Definition at line 316 of file CSlider.h. Referenced by getOriginalValue(), resetValue(), setOriginalValue(), and setSliderObject(). The slider object pointing to the slider's object afteer compile. Definition at line 301 of file CSlider.h. Referenced by compile(), getSliderObject(), isValid(), setMaxValue(), setMinValue(), setSliderObject(), sync(), and writeToObject(). The scaling of the slider. Definition at line 346 of file CSlider.h. Referenced by getScaling(), and setScaling(). The value type of the slider's object. Definition at line 306 of file CSlider.h. Referenced by getSliderType(), resetRange(), setMaxValue(), setMinValue(), setOriginalValue(), setSliderType(), setSliderValue(), and sync(). Wether the CSlider's value is always in sync with its object's value. Definition at line 341 of file CSlider.h. Referenced by compile(), getSynced(), setSliderObject(), setSliderValue(), and setSynced(). The factor between minor and major ticks. Definition at line 336 of file CSlider.h. Referenced by getTickFactor(), and setTickFactor(). The number of ticks the slider is divided into. Definition at line 331 of file CSlider.h. Referenced by getTickNumber(), and setTickNumber(). Definition at line 311 of file CSlider.h. Referenced by getSliderValue(), setMaxValue(), setMinValue(), setSliderValue(), sync(), and writeToObject(). Definition at line 50 of file CSlider.h. Definition at line 45 of file CSlider.h. Referenced by CCopasiXML::saveGUI(), and CCopasiXMLParser::SliderElement::start().